J. N. Roberts, who has been dangerously ill during the past two weeks, is slowly recovering. G. F. Roberts, of Blows Factory was here Thursday. Source: Crittenden Press. (Marion, Ky.) 1879-1907, February 27, 1902, Image 8 - Chronicling America - The Library of Congress. We are sorry to learn of the illness of our friend J. N. Roberts, of Mattoon. Source: Crittenden Press. (Marion, Ky.) 1879-1907, March 13, 1902, Image 16 - Chronicling America - The Library of Congress. Harve Roberts, of Mattoon, has moved to our town. Source: Crittenden Press. (Marion, Ky.) 1879-1907, April 17, 1902, Image 8 - Chronicling America - The Library of Congress. Frank Roberts, of Blackburn, visited here last week. Source: Crittenden Press. (Marion, Ky.) 1879-1907, March 5, 1903, Image 8 - Chronicling America - The Library of Congress. A little child of Harve Roberts is very sick. J. N. Roberts visited Jno. Simpson Sunday. Source: Crittenden Press. (Marion, Ky.) 1879-1907, March 12, 1903, Image 13 - Chronicling America - The Library of Congress. J. N. Roberts and wife visited the family of John Simpson Sunday. Tom Roberts and wife visited here Friday. Source: Crittenden Press. (Marion, Ky.) 1879-1907, March 19, 1903, Image 8 - Chronicling America - The Library of Congress. 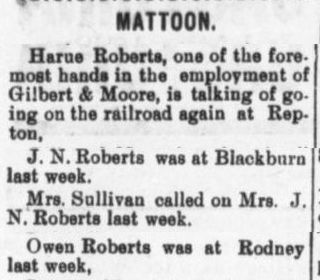 Harue [Harve] Roberts, one of the foremost hands in the employment of Gilbert & Moore, is talking of going on the railroad again at Repton. J. N. Roberts was at Blackburn last week. Mrs. Sullivan called on Mrs. J. N. Roberts last week. Owen Roberts was at Rodney last week. Source: Crittenden Press. (Marion, Ky.) 1879-1907, March 26, 1903, Image 8 - Chronicling America - The Library of Congress. John E. Roberts of Mattoon, was here Monday. Owen Roberts of Mattoon, was here Wednesday. John Simpson visited J. N. Roberts Sunday. 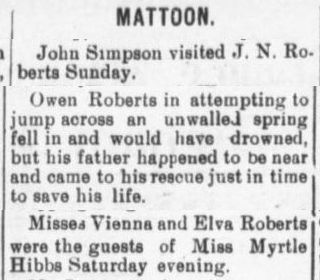 Owen Roberts in attempting to jump across an unwalled spring fell in and would have drowned, but his father happened to be near and came to his rescue just in time to save his life. Misses Vienna and Elva Roberts were the guests of Miss Myrtle Hibbs Saturday evening. Source: Crittenden Press. (Marion, Ky.) 1879-1907, April 2, 1903, Image 13 - Chronicling America - The Library of Congress. Mesdames Burton, Sullivan and Travis called on Mrs. Frank Roberts Sunday. J. N. Roberts visited Mr. D. L. Hibbs Sunday. Miss Vienna Roberts began her school at the Moore school house Monday with a large number of pupils. Source: Crittenden Press. (Marion, Ky.) 1879-1907, April 16, 1903, Image 8 - Chronicling America - The Library of Congress. Mrs. Ida Roberts and son, of Mattoon, were visiting here Sunday. Source: Crittenden Press. (Marion, Ky.) 1879-1907, May 7, 1903, Image 8 - Chronicling America - The Library of Congress. 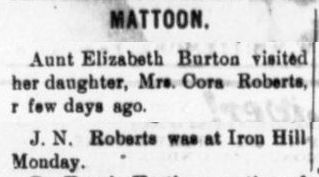 Aunt Elizabeth Burton visited her daughter, Mrs. Cora Roberts r [a] few days ago. J. N. Roberts was at Iron Hill Monday. Source: Crittenden Press. (Marion, Ky.) 1879-1907, May 21, 1903, Image 16 - Chronicling America - The Library of Congress. Frank Roberts, of this place, is building a barn for Tom Travis near Iron Hill. Source: Crittenden Press. (Marion, Ky.) 1879-1907, May 28, 1903, Image 8 - Chronicling America - The Library of Congress. 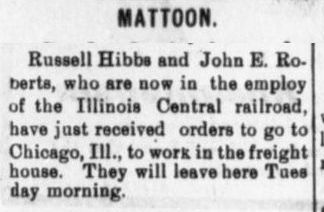 Russell Hibbs and John E. Roberts, who are now in the employ of the Illinois Central railroad, have just received orders to go to Chicago, Ill., to work in the freight house. They will leave here Tuesday morning. Source: Crittenden Press. (Marion, Ky.) 1879-1907, June 4, 1903, Image 8 - Chronicling America - The Library of Congress. Miss Melia Merritt, was the guest of Misses Vienna and Elva Roberts Sunday. Source: Crittenden Press. (Marion, Ky.) 1879-1907, June 11, 1903, Image 15 - Chronicling America - The Library of Congress. Jim Harmon, of Repton, visited John E. Roberts Sunday. Ed Brown and his sister visited the family of J. N. Roberts Sunday. Source: Crittenden Press. (Marion, Ky.) 1879-1907, June 18, 1903, Image 15 - Chronicling America - The Library of Congress. John and Jim Burton called on John E. Roberts Sunday. Harve Roberts and family visited at Tribune Sunday. Source: Crittenden Press. (Marion, Ky.) 1879-1907, July 7, 1903, Image 15 - Chronicling America - The Library of Congress. John E. Roberts, of Mattoon, visited here Sunday. Mrs. Ida M. Roberts and son, of Mattoon, visited here Sunday. ANNISTON, MO., Aug. 1, 1903.--EDITOR PRESS: If you will allow me space in your paper I will write a short letter to let my friends in old Crittenden know where I am located. I have been here several days and am more than satisfied with this country. This part of Missouri is undoubtedly one of the richest and most productive spots on earth. The crops are fine and business of every kind is on a boom. Wages are high and hands are in great demand. I am now at work with Will Nunn, a carpenter formerly of Crittenden county, Ky. He has already more work that he can do this season. He has made Anniston a thriving little town since he came here. He says he will work here until the first of September and then go to Texas to work at his trade. My advice to every young man that makes his living by daily labor is to come here, as work is plentiful, wages good and hands in demand. This county is the place for Crittenden renters, too. Rent is cheaper here, the land will produce anything, and will never wear out. Some people think this is an awful sickly country, but I find it as healthy as any place that I ever lived at. As a matter of course this county at one time was sickly, for it has not been many years since this was a swampy forest of cypress and oak. But ditches are now cut here miles long that drain the country, the woods are being cut down and cleared up everyday which will make it as healthy as any hill in Kentucky. Source: Crittenden Press. (Marion, Ky.) 1879-1907, August 13, 1903, Image 5 - Chronicling America - The Library of Congress. Harve Roberts and family are visiting at Tribune. 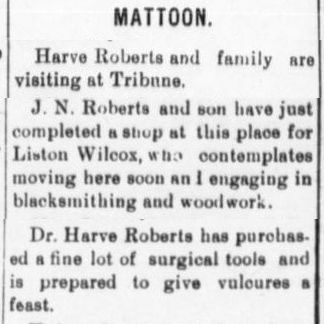 J. N. Roberts and son have just completed a shop at this place for Liston Wilcox, who contemplates moving here soon and engaging in blacksmithing and woodwork. Dr. Harve Roberts has purchased a fine lot of surgical tools and is prepared to give vulcures [vultures] a feast. Source: Crittenden Press. (Marion, Ky.) 1879-1907, August 13, 1903, Image 15 - Chronicling America - The Library of Congress. Frank Roberts and Henry Summers were in the Iron Hill neighborhood Sunday. Source: Crittenden Press. (Marion, Ky.) 1879-1907, August 20, 1903, Image 8 - Chronicling America - The Library of Congress. J. N. Roberts spent Saturday with relatives at Tribune. J. G. [N.] Roberts and son have just completed a barn for Riley Rowland. 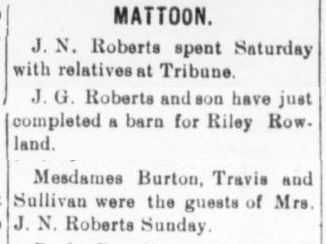 Mesdames Burton, Travis and Sullivan were the guests of Mrs. J. N. Roberts Sunday. Source: Crittenden Press. (Marion, Ky.) 1879-1907, August 27, 1903, Image 8 - Chronicling America - The Library of Congress. Mrs. Ida Roberts, of this place, visited at Rodney last week. Source: Crittenden Press. (Marion, Ky.) 1879-1907, September 17, 1903, Image 8 - Chronicling America - The Library of Congress. 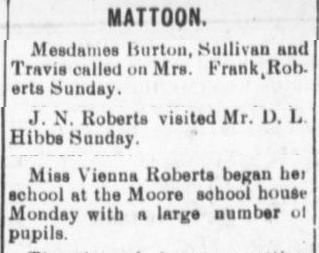 Mrs. Roberts, wife of Tom Roberts, of Mattoon neighborhood, died Monday night and was buried Tuesday at the Repton graveyard. Source: Crittenden Press. (Marion, Ky.) 1879-1907, October 22, 1903, Image 5 - Chronicling America - The Library of Congress. Mrs. Cora Roberts, who has been confined to her bed for five weeks is still in a critical condition; her physician, however, expresses the hope she may recover. John Thomas and wife spent Sunday afternoon with the family of J. N. Roberts. I hastened forth to be. And left the thorns to me. "Are thorns the object of my quest?" A voice replied: "Yea gather these"
What God appoints is best. Each thorn a priceless gem. And lo! a sparkling diadem. All perished in a day. They all were swept away. Mattoon, Ky. Oct. 19, 1903. Source: Crittenden Press. (Marion, Ky.) 1879-1907, October 22, 1903, Image 9 - Chronicling America - The Library of Congress. Mrs. Cora Roberts, daughter of John O. and Elizabeth Burton, was born Oct. 28th, 1865, married Thos H. Roberts Dec. 27th, 1894, and died Oct. 19th, 1903. Mrs. Roberts professed faith in Christ several years ago, and during her sickness expressed her willingness to die. The best medical aid was secured in her behalf, loving friends and neighbors fought to do all that could be done to alleviate her sufferings, but to no avail. She grew daily worse and after five weeks of suffering death came to her relief. Her remains were laid to rest in the cemetery at Repton. Her husband, precious little son, aged mother, several brothers and sisters are left to mourn her loss. But while their heads are bowed in grief and their hearts are filled with sorrow, we trust they have the sweet consolation of Christ, who hath declared that all who believe in Him, even though they die, shall live again, immortalized and beautified, made forever free from sin, sorrow, disease and death. Source: Crittenden Press. (Marion, Ky.) 1879-1907, November 19, 1903, Image 7 - Chronicling America - The Library of Congress. J. N. Roberts was in Marion Monday. Source: Crittenden Press. (Marion, Ky.) 1879-1907, November 19, 1903, Image 8 - Chronicling America - The Library of Congress. Mrs. Ida Roberts of this place spent Saturday and Sunday with her sister at Rodney. Source: Crittenden Press. (Marion, Ky.) 1879-1907, November 26, 1903, Image 8 - Chronicling America - The Library of Congress. Mrs. Ida Roberts and sons, of Mattoon were here Sunday. 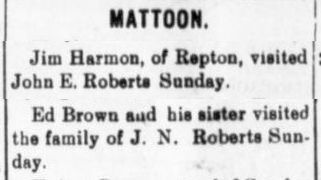 John E. Roberts of Mattoon visited here Sunday. Source: Crittenden Press. (Marion, Ky.) 1879-1907, December 3, 1903, Image 8 - Chronicling America - The Library of Congress. John Roberts spent Sunday at Rodney. Source: Crittenden Press. (Marion, Ky.) 1879-1907, December 10, 1903, Image 8 - Chronicling America - The Library of Congress. Though all of earth and hell oppose. A wall of fire around about. No right have I to make defense. "Vengeance is mine, I will recompense." I'll overcome by faith and prayer. Help me to keep my record clear. Forever, Lord, I'll dwell with Thee! Source: Crittenden Press. (Marion, Ky.) 1879-1907, October 22, 1903, Image 7 - Chronicling America - The Library of Congress.